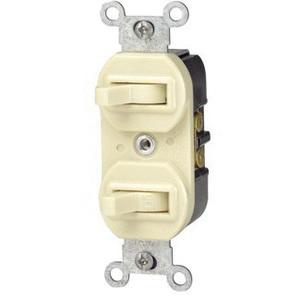 Leviton 1-Pole Duplex style 3-Way AC combination switch in ivory color, has voltage rating of 120/277-Volt AC and current rating of 15-Amps. Switch has power rating of 1/2 hp at 120-Volts and 2 hp at 240 - 277-Volts. Silver cadmium oxide contacts of this switch prevent sticking, welding and excessive pitting. It withstands dielectric voltage of 1500-Volts for 1 min.